Have you ever wondered what kind of first impression your house is making? Your front door is often a big part of that. The stunning entry doors installed by West Shore Home will have your house screaming “Look at me!” and your neighbors asking, “Where can I get a door like that?” Our custom-fitted entry doors are available in a multitude of styles, woodgrain finishes, and color options, and can be further customized with a spectacular selection of glass inserts, sidelites, transoms, and optional add-ons such as storm doors. Regardless of what front door style you choose, our certified and trustworthy team will have it installed in no time, leaving you with an incredible new door in just one day. We know that protecting your loved ones and possessions is of the utmost importance, which is why we offer top-of-the-line entry doors that have undergone rigorous forced-entry testing and have passed with flying colors, giving you peace of mind that your home’s front entryway will be secure. Not only will our entry doors help keep out potential intruders, they will also provide your home with a weathertight barrier against wind, rain, snow, and other harsh elements. Our energy-efficient front doors will stop heat transfer in its tracks, keeping your home cooler in the summer and warmer in the winter, and may even help lower your monthly heating and cooling costs. 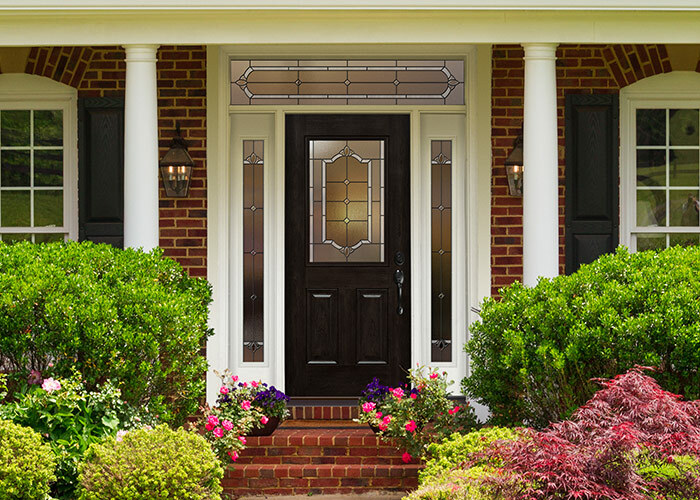 All of our entry doors are rigorously tested and certified by independent laboratories to meet the ENERGY STAR® standards established by the Environmental Protection Agency (EPA) and the U.S. Department of Energy. Your front entrance is the focal point of your home’s façade, so greet the world with a unique, eye-catching entry door that you will love coming home to every day. Our front doors are expertly engineered to be as sturdy as they are stylish. With fiberglass and steel options outfitted with locksmith-grade hardware, safe and secure never looked so good.